Hazardous Chemicals are used by nearly all of the research labs at the University of Virginia (UVA), as well as in many of the construction, maintenance and housekeeping operations performed on UVA grounds. 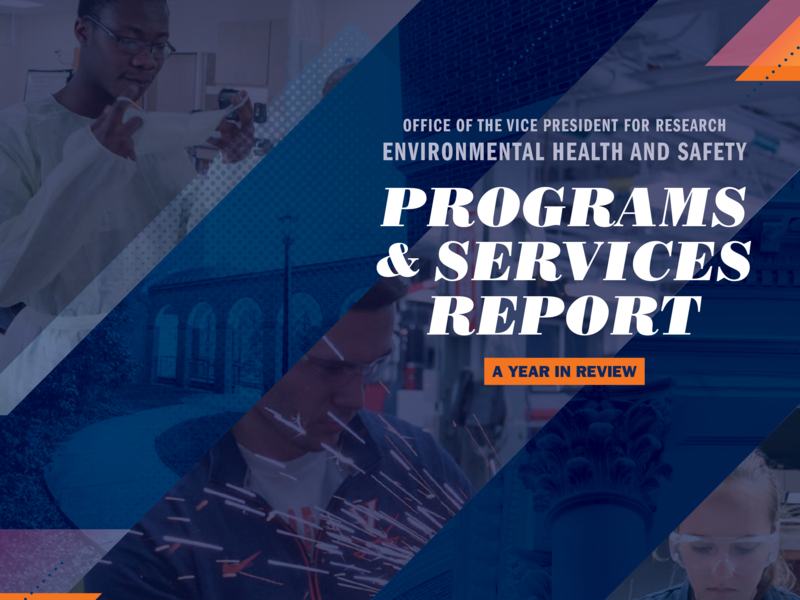 On these pages you will find useful information regarding the policies and procedures that UVA has implemented to keep you and the environment safe from hazardous chemical exposure. 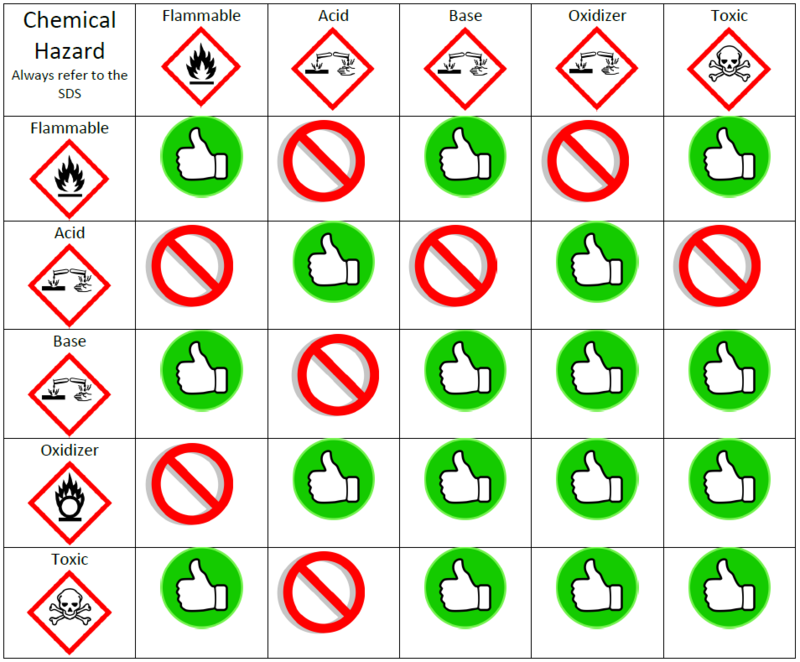 Basic Chemical Safety and Hazardous (Chemical) Waste collection information can be found in UVA's Hazard Communication ("Right-to-Know") document word | pdf. 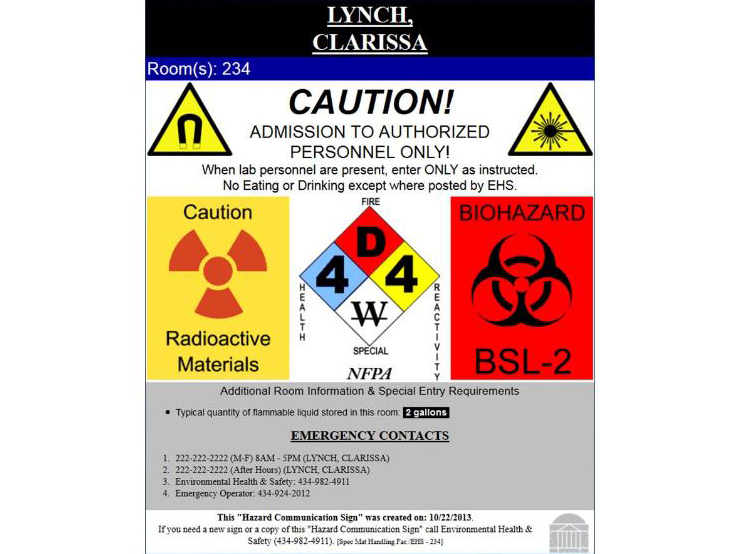 More detailed Chemical Safety and Hazardous (Chemical) Waste collection information can be found in UVA's Chemical Hygiene Plan word | pdf. Aerosol cans are prohibited from being thrown in the trash at UVA! 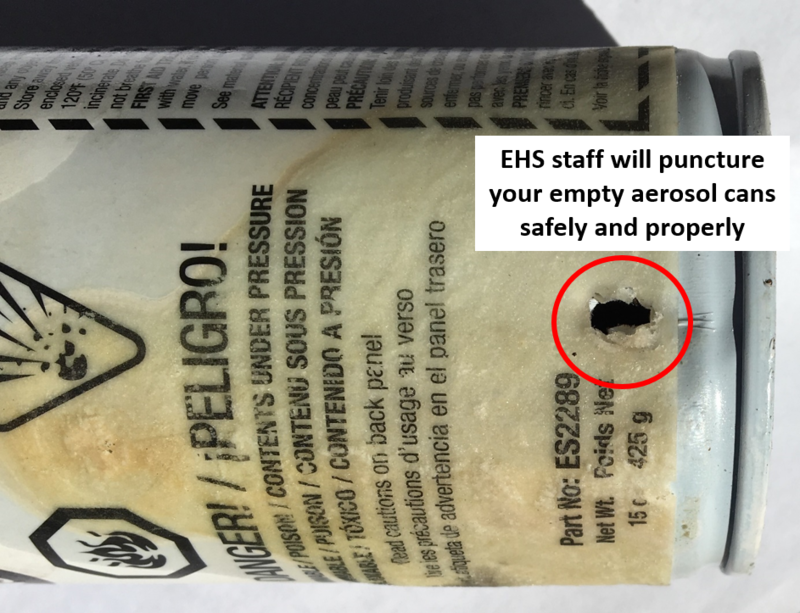 Virginia's Department of Environmental Quality requires that all aerosol cans (unused, partially used, damaged, & empty) be collected as Hazardous Waste. 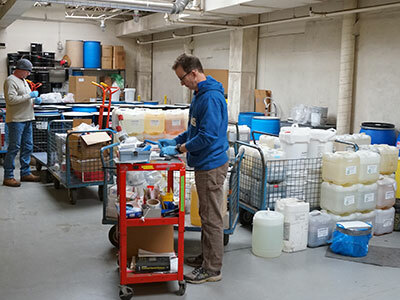 The EHS Chemical and Laboratory Safety group periodically inspects all laboratories, and educational shops, studios and makerspaces across UVA. EHS also inspects select non-academic University spaces that utilize chemicals and generate hazardous waste. Satellite Accumulation Areas are the areas in a labs or work spaces where hazardous waste containers are stored when full. These areas must be "near the point of generation" of the waste. New Regulations require the posting of this sign in the Satellite Accumulation Areas at the University. EHS and UVA Health System are in partnership to provide the UVA community with access to a searchable web-based SDS library. Each department, laboratory, or unit is responsible for ensuring up-to-date SDSs are available for the hazardous chemicals used in their workspace. 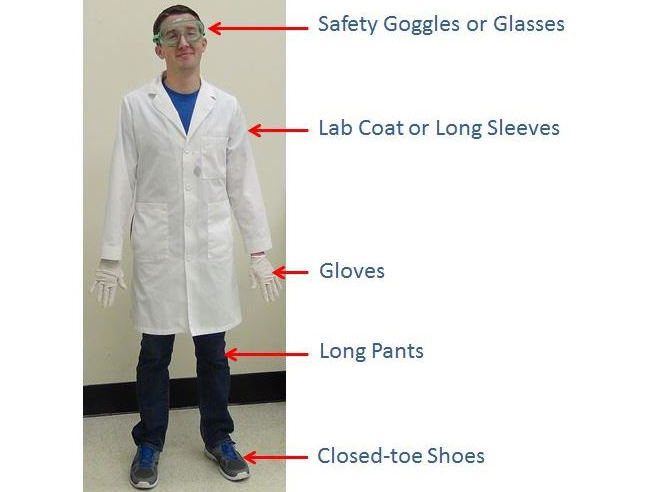 The Association of Public and Land-grant Universities (APLU) has formed the Task Force on Laboratory Safety to provide research universities with recommendations and guidance on the most appropriate strategies to enhance a culture of laboratory safety. Unwanted cans (unused, partially used, damaged, & empty) must be collected as Hazardous Waste. New Regulations require the posting of a sign in locations where hazardous waste containers are stored when full. 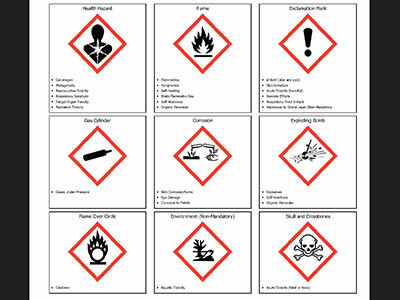 New regulations require updated Hazardous Waste Stickers and waste labeling requirements. Refer to our guidelines to properly set-up a vacuum trap.